The Evolve Markets Metatrader 5 platform offers up to 500:1 leverage for FX and 50:1 Leverage for Bitcoin and altcoins. All accounts are created with the default leverage settings called "FX 500 - BTC 50". Max Exposure in MT5 lots indicates the maximum cumulative net size in a single direction that can be open per trading symbol under the current leverage setting. For example, the leverage settings of "FX 500 - BTC 50" would allow you to use 500:1 leverage and open upto 55 Lots of EURUSD exposure in a single direction. When trying to open more than 55 lots of exposure in one direction, the platform will give an error "Volume limit reached" . 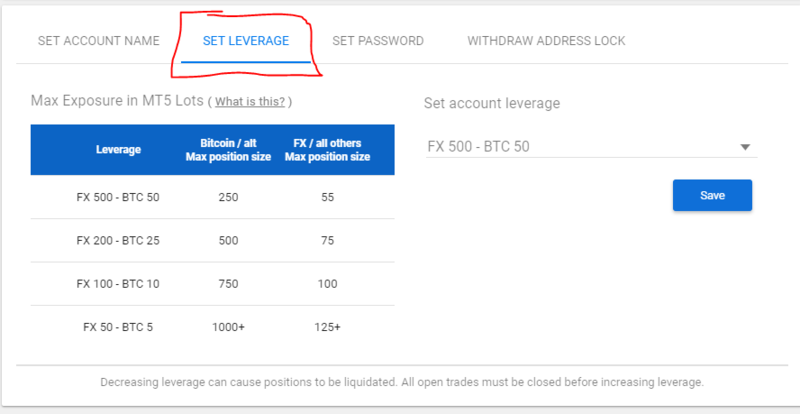 If you wish to trade larger positions sizes than indicated on the table, it's required to change the leverage settings when there are no or orders in the account.